When is a bishop not a bishop? First, within Anabaptist-Mennonite circles in Poland-Prussia when the Roman Catholic Church did not allow the Mennonite Church to have leaders called bishops (Darryl Klassen). The church chose Elder (Aeltester) as an alternate title, yet much of the authority and functions of a bishop remained: to oversee churches, ministers, and deacons; to baptize and serve communion; and to ordain. Unlike a Catholic bishop, though, whether a Mennonite bishop had individual authority to excommunicate seems to have varied in history (Henry Fast). Second, when a bishop resigns. The fourth KG bishop Heinrich Enns (1807-1881) began serving a “reform” group in Russia in 1866 and then, only two years later, resigned amid a lack of confidence by others. There was no indication or allegation of any immorality by Enns. Historian Delbert Plett says that Enns remained respected until he died. Perhaps they were, but what might Delbert have thought of a third letter that Enns wrote from Kansas? Plett seemed unaware of it. It seems to have gone untranslated until recent work within the EMC Archives, and more of its significance was realized when I worked with it on June 27, 2018. Earlier this year historian Henry Fast had turned over to the EMC Archives a collection of about 80 letters sent to minister Peter B. Kroeker (1873-1955), some dating back to the 1890s. They were given with the support of Kroeker’s family, and are valuable. 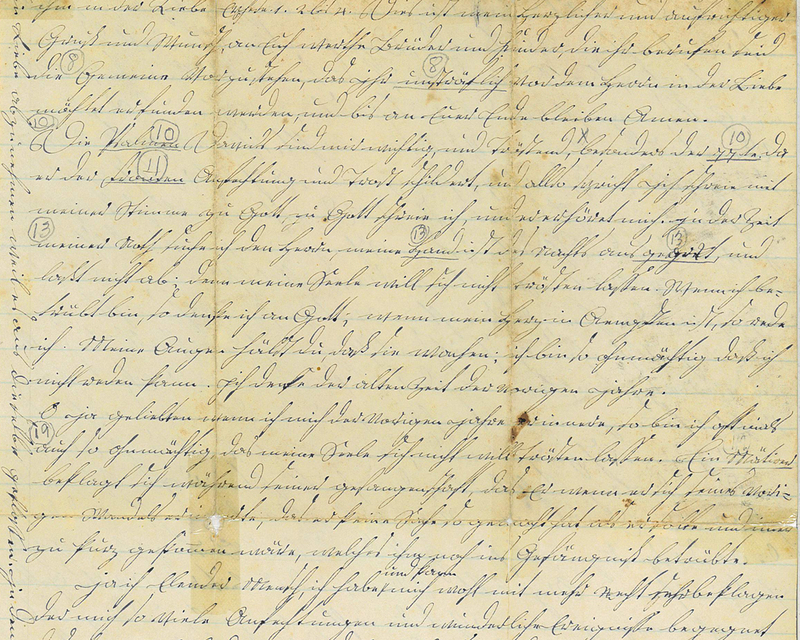 Lee Toews, a relative of Kroeker’s, had earlier rewritten some letters into modern German. Harvey K. Plett and Esther Wiebe, and more recently Ellen Stoesz, Ann Fehr, and Sara Peters have been translating the collection into English. Yet one item dated April 30, 1877, didn’t fit into Kroeker’s period of correspondence, and a note, likely by Toews, said it appeared to be a letter to a church community. It was the letter by Enns, and an extraordinary acquisition. He wrote it shortly after the KG moved to Canada in 1874-75 and just four years before his death. Enns, according to Plett, was “a strong willed man whose determination and one-mindedness sometimes hindered his effectiveness.” In a writing attributed by Plett to him, the former bishop held that the baptism of an adult “in an unconverted condition” and without “the right understanding” has “no more value than an infant baptism” and “can even be dangerous” for its misleading consolation. Was Enns wrong or right on this? Enns struggled in leadership, felt keenly his weaknesses, had strong convictions, sought to be conciliatory, and looked to God’s grace. Would we expect less of any bishop? Sources: Plett, Pioneers and Pilgrims, 1990, 533-540; Plett, Leaders, 1993, 379-400.